Just last week I got a call from one of our Pet Detectives located in Ohio. He called to report that one of the Search Dogs, a Bloodhound named Luscious, was itching. Here is the short list of the 6 most common causes to itching in pets. See if you can guess which one Luscious was suffering from! Fleas – It can only take a few bites for a pet to start itching like crazy. When a pet itches, it can make the skin become more irritated, which can then become susceptible to infection. Food Allergies – Many pets have food allergies. Keep in mind that an allergy can develop as a pet ages, even if it wasn't there before. Food allergies can spontaneously occur without any change in what the pet is eating. Environmental Allergies – Pets can be allergic to things like pollen, mold, and house dust! Mites – Mites are another parasite that can cause a pet to itch. To find if your pet has mites, a veterinarian can test your pet based on the symptoms. Ringworm – Ringworm isn't a worm! It is a fungal infection. If you have worked in rescue, you have probably had to deal with a pet with ringworm. Ringworm usually causes hair loss in a round, or ring shaped pattern. A veterinarian can diagnose this in a pet. Other – The other five reasons why pets itch here are really the most common, but there are some other, less-likely possibilities. If your pet isn't itching because of one of the other reasons listed here, you will have to talk to your veterinarian and get to the bottom of the scratching! Other possibilities include fungal infections other than ringworm, bacterial skin infections and immune issues. Now that you know the six most common reasons why pets itch, what do you think our lost pet recovery Search Dog was suffering from? If you guessed the common flea, you are right! After a few baths with special natural flea shampoo, Luscious is back to sniffing out lost pets! Annalisa is the author of the Lost Dog Recovery Guide and Lost Cat Recovery Guide and has been assisting with the recovery of lost pets for over 7 years. 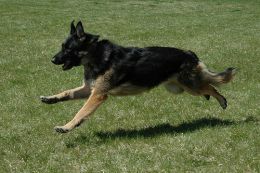 For more information go to www.PetSearchAndRescue.com or call Pet Search and Rescue at 800-925-2410.